For the month of March, my students participated in a Rhythm Challenge. Each grade level first through fourth grade (my highest grade) competed against other classes in their grade level and were told there was a "surprise prize" at the end for the winning class. 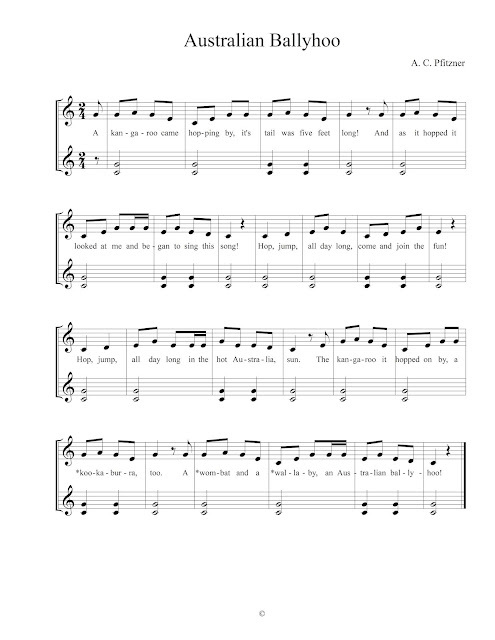 Students read an played rhythm cards appropriate to their level at the beginning of each class along to a rap track. Before reading each card, I would say in rhythm, "Ready go". If one or two mistakes were made on a card, I called it an oops and a forgiveness. If three or more mistakes were heard, I called time and that was the high score for the day. If anyone "fussed" at another student for making a mistake (long chat about how everyone makes mistakes) the class would lose 30 second off their score. Thankfully no one lost time off their score. Top score was 2 minutes, 30 seconds. I kept track on the board each week and after 4 weeks or 4 scores (whichever came first) we had winners. Then, the best part- the Surprise Prize - everyone was having a Glow in the Dark Music Party during their next music class! The winners would have the Party for the whole class and the others for half their class (half the class was regular music but would have games and other fun activities we don't do very often). It was a HUGE hit! I posted a video yesterday on my facebook page - @o for tuna orff, and show the setup and talk about activities. This would be a PERFECT end of the year music party! Then I realized I needed to make it a blog post! It truly has been one of the highlights of my year and while it takes some prep, is SO worth it!! I even did the Clap Clap song by the Klaxons with my youngest student so they could experience some of the fun. Of course, everyone loved getting to take a glow stick home with them! If you would like a pdf of this, please send me an email at musicquilt@hotmail.com. I have been working on sixteenth notes with my third and fourth graders (my top grade is fourth) and realized I needed to finish a collection I began last year. Time got away from me but now it is finally finished. There are singing games, activities, and even a canon. This is not a comprehensive list of songs with sixteenth notes, simply my favorite ones and ones I want to develop further. If you would like the full 30 page pdf with 26 songs (!!!) shoot me an email asking for the collection at musicquilt@hotmail.com. 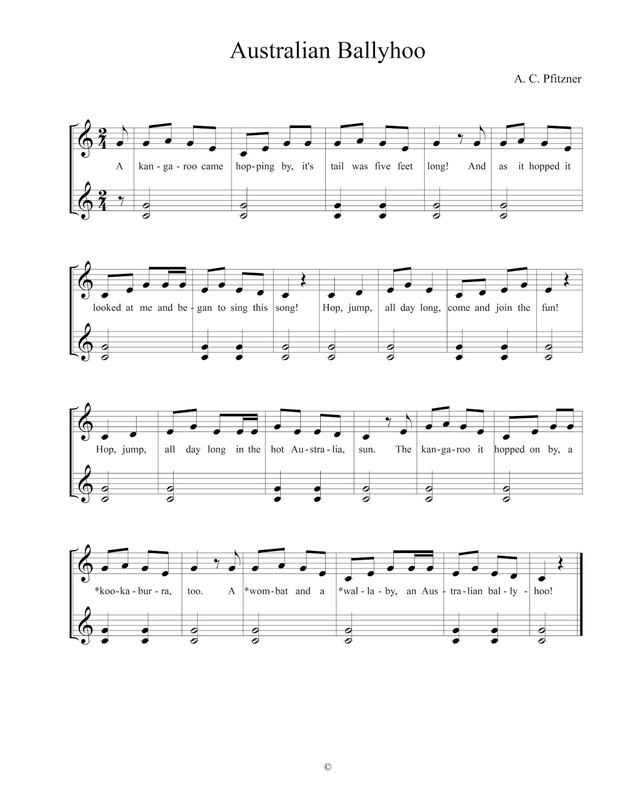 I posted a few weeks ago about Carnival of the Animals and a HUGE 23 page pdf you can get for free with many activities to correspond with various pieces from Camille Saint-Saens famous collection. I realized when writing the activities that I wanted a song about Kangaroos and even reached out to some friends in Australia and New Zealand and found a couple songs but these were more commercially available (chord changes, lots of words, etc.) and not "elemental". They were ones that were cute but lacked content which is a bit of a pet peeve with me as I strive toward content over cuteness. I was looking for songs to reinforce various concepts used with first and second graders, which is where most music teachers "place" Carnival of the Animals. So... you know me; I had to write one. First, let's discuss one of my favorite words, "ballyhoo". I use the third one in talking with kids about "ballyhoo". In the song below, you will notice * next to some words. Have children brainstorm a list of animals from Australia. Sing the song again, this time replacing the * animal names with some of the ones from the brainstormed list. You can certainly add so much to this song! We played it as a game, everyone standing in a circle, one player on the outside of the circle. This outside player is the kangaroo and has to jump (both feet together) around the outside of the circle. On "kookaburra", "wombat" and "wallaby", this player tags three other players and they jump together around the circle. Begin again, this time the "kangaroo" will not choose any players but the 3 who just joined (kookaburra, wombat, and wallaby) will each choose 3 new players to join, etc. 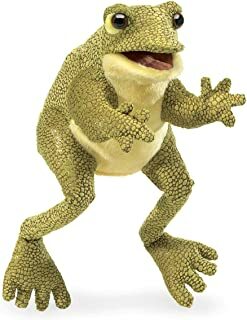 Pretty soon everyone is jumping around the room and you will have a tired bunch of kiddos ready for a quieter activity. 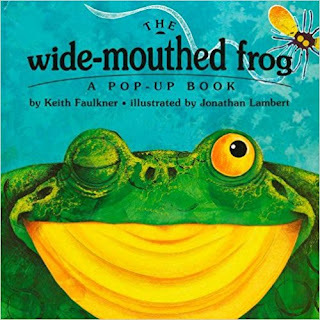 I have blogged about this lesson before as I LOVE this book and activity and it is perfect for spring when we start to hear and see more peepers out and about! For those who have seen it before, HOLD ON because this post has some new things! For those of you with snow still, spring IS coming!!! You are going to need this book, get the popup version- a MUST have! As always, if you want the full pdf of both lessons, send me an email request at musicquilt@hotmail.com. 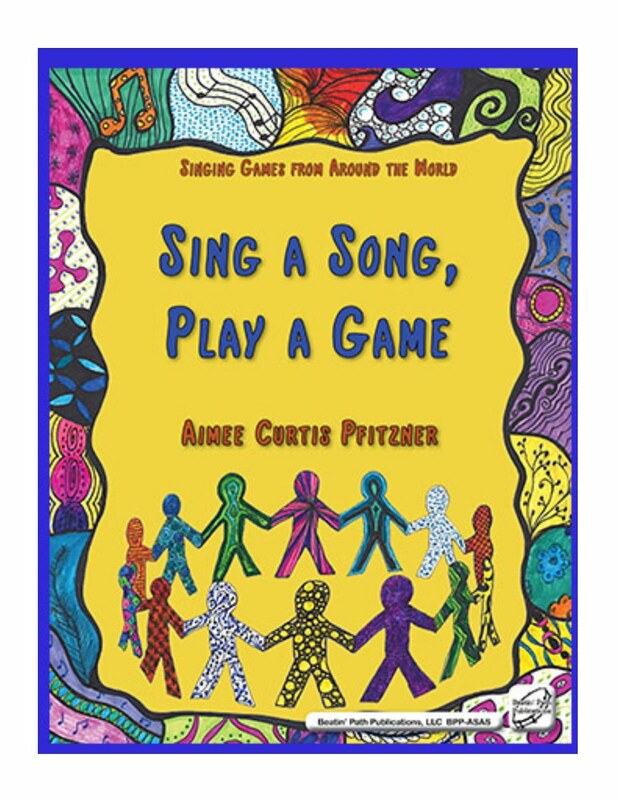 I have loved this collection of songs for a very long time, but have always struggled to find ways to meaningfully engage my students in active, hands-on activities. Over the past several school years I have spent some time and been more intentional in finding and developing some lessons that truly engage my students and help them to remember the wonderfully fun pieces of music. 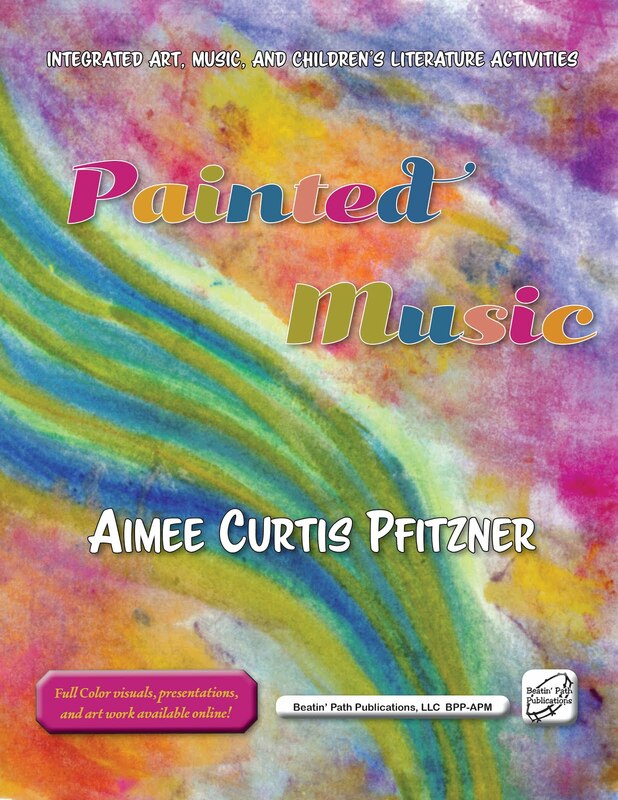 If you would like the full 23 page pdf, send me an email - musicquilt@hotmail.com. I am a fairly new convert to instagram. I say convert because I used to get a lot of my teaching ideas from pinterest and facebook. Instagram has a plethora of music teachers and it is growing daily with wonderful teachers (among others) sharing lessons, teaching ideas, etc. I have used the book, "Rap Tap Tap" before, but haven't used it in a long while. Then, just yesterday, I saw a post from the amazing @snapclappattersonmusic and it all came together! Music in Our Schools Month is just a few days away and this is a wonderful transition from Black History Month as this year's theme is All Music, All People. Love the inclusivity of the theme! Try something new this month- get out of your American folk song comfort zone and share information, culture, and musical culture of students from around the United States - we are from so many places with rich music histories and ways of using music to celebrate, dance, sing, mourn, and bring together communities. Read the book, after each page, say, "Rap, tap, tap, think of that". Rhythm is quarter, quarter, quarter, rest, quarter, quarter, quarter, rest. Read book again, add rhythm sticks with speech. 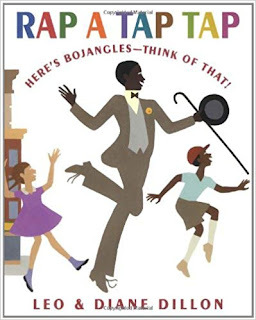 @snapclappattersonmusic had her students stand and tap dance the rhythm of "Rap, tap, tap, think of that" after each page. Then I had my students stand and try out some tap moves. This video is SO nice and slow and really perfect for our wee ones! Now we are ready to tap the rhythm already learned - stand and tap dance the rhythm of "Rap, tap, tap, think of that" after each page. I had my kiddos try out some heels, toes, and brush steps and they rocked it! So fun! 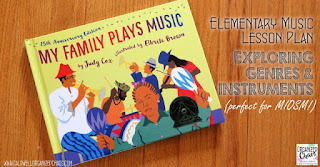 Now go check out this AMAZING post from Elizabeth at Organized Chaos for a lesson already ready for you using the book, "My Family Plays Music". This one is perfect for SO many grade levels.